Kellogg Community College student Cory Farfan is about to complete a journey at KCC that began in 2013 as she graduates May 11 with three associate degrees. When Farfan, of Battle Creek, started at KCC, she was a new mom to a beautiful little girl, a life change she says motivated her to study as a way to better their future. Since then, Farfan’s had two other children and earned Administrative Assistant, Medical Administrative Assistant and Word/Information Processing Associate in Applied Science degrees. 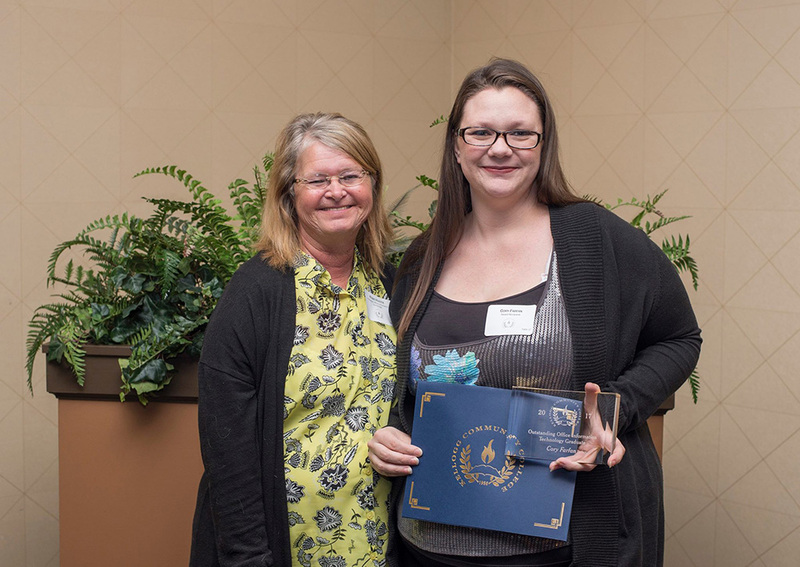 Pictured above, Cory Farfan, right, accepts the award for Outstanding Office Information Technology Graduate 2017 from KCC OIT instructor Robin Hunter at the College’s annual Awards Banquet ceremony held, at the Battle Creek Country Club on April 27.